AviFlax Gold is a human-grade milled flax product processed specifically for feeding to birds. Aviflax Gold is chemical free and non GMO and an all natural product that improves the health of parrots and their offspring. Omega 3, 6 & 9 from flaxseed has been shown the enhance antibody production and protect against hypertension. In studies of parrots, Omega 3 fatty acids were associated with a reduced incidence of atherosclerosis. In another interesting study, the hatchlings of parents fed flax oil were found to have higher levels of antibody production. Only premium Northern-grown flax seed is used for AviFlax Gold. Flax seed is not usable whole and must be ground to release beneficial fatty acids. While flax oil contains Omega fatty acids, whole milled seed is better for birds as it provides the fiber, antioxidants, lignans and proteins missing from oil in an easy to feed form. 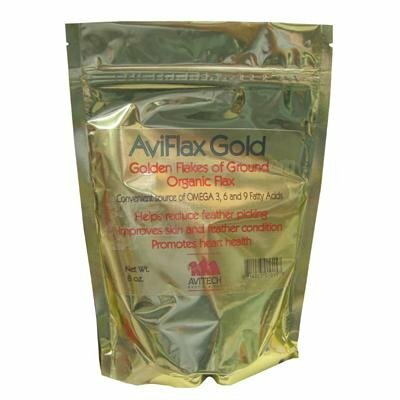 AviFlax Gold can be sprinkled on dry or moist food or mixed into egg food. AviFlax Gold can also be baked into bird bread recipes. If you have any questions about this product by Avitech, contact us by completing and submitting the form below. If you are looking for a specif part number, please include it with your message.